If you recall my last video from Shanghai, I went shopping for 40 cent beer and $10 HÃ¤agen-Dazs ice cream. Quite a few readers commented about the price of HÃ¤agen-Dazs in China and wonder how the company can sell their product when local ice creams sell for 20 times less. Well, it seems that not only does HÃ¤agen-Dazs sell well in China, they sell so well that the company runs what has to be the fanciest ice cream shop in the world! HÃ¤agen-Dazs is a great example of the power of the brand. When your product is perceived to be of an exceptional quality, you can command a high premium for it. HÃ¤agen-Dazs is to ice cream what Apple is to computers. The Shanghai HÃ¤agen-Dazs ice cream store/restaurant (I don’t know what to call it) is located at the Shanghai Grand Gateway Plaza, home of Microsoft China and a really high end shopping mall. First time visitors will be quite taken back by it. Baskin Robbins has got nothing on this place! It’s a full sit down restaurant but all they serve is HÃ¤agen-Dazs ice cream. The prices are well beyond what a typical Chinese worker can afford. The most expensive item on the menu cost 238RMB ($35US). 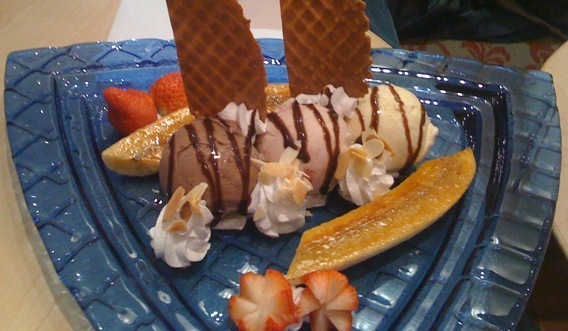 Our banana split came in at 79RMB ($12US). To put all this into perspective, the average income of a Chinese factory worker is 1000RMB ($150US) per month. If I didn’t think the Shanghai HÃ¤agen-Dazs caters to foreigners and rich locals only, I did when the waitress asked if I wanted the receipt made out to my company! They also offer a VIP card. To qualify, you have to spend 500RMB at the store during a two month period. Let’s see. 500RMB can buy 167 beer or two of HÃ¤agen-Dazs’ most expensive ice creams. Which would you go for?